Fort Leavenworth, 1854. Shawnee Mission, 1854-1855. Pawnee, 1855. Lecompton, 1855-1861. 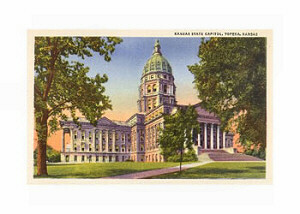 Topeka, since 1861. January 29, 1861, 34th State. Kansas Geography, 82,282 square miles. Constitution: Kansas Constitution, 34th state to enter the Union. Manufacturing: Transportation equipment (light aircraft, military aircraft, missiles, aircraft parts, railroad freight and passenger cars, locomotives) is Kansas' primary manufactured product. Food processing (flour-milling, animal feed, meat-packing plants) is ranked second in the state. 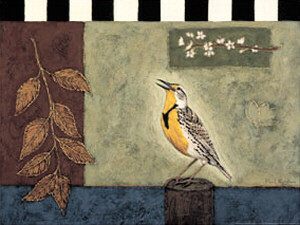 Printed materials (newspapers, school yearbooks) are also produced in Kansas. Services: The leading service industries in Kansas are in the community, business and personal services sector. 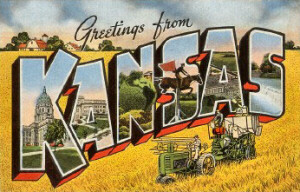 Concentrated in Kansas' metropolitan areas, private health care, law firms, data processing companies, hotels, repair shops and customer service call centers are important. Ranking second in Kansas are the wholesale (farm product distribution, groceries, machinery, motor vehicles) and retail (automobile dealerships, grocery stores, department stores, restaurants, service stations) trade industries. Government services (public schools, hospitals, military activities) are the third ranking services sector in Kansas. Mining: Almost every county in Kansas is involved in some kind of mineral production. Petroleum and natural gas are the most important mined products in the state. Other products are gypsum, helium, limestone and salt. Highest Point: Mount Sunflower, 4,039 feet above sea level. Lowest Point: Verdigris River, 679 feet above sea level. Natural Resources: Kansas' most important natural resources are its very fertile soil and its mineral deposits (Petroleum, natural gas, clays, gypsum, helium, natural gas liquids, salt, sand and gravel, stone).